One of the best parts of New Years Eve is waiting for the ball to drop. While you cozy up to your loved ones and anticipate the approach of the New Year, the kids may be excitedly waiting with you, or maybe they’re sleeping, or perhaps you are hosting a gathering with friends. Regardless of your New Years Eve plans, if you’re over the age of 21, a drink or two is bound to ensue. While our Primal ancestors more than likely were not consuming Cosmopolitan mixers or sipping bubbly, alcohol is not completely off limits when following a Paleo lifestyle. There might be some conflict out there about what is and isn’t acceptable as far as drinking on the Paleo Diet goes. The true essence of being Paleo is really about staying as far away from potentially toxic, processed, and industrialized ingredients as possible, and staying true to nature intended as a life practice. Furthermore, getting to know one’s body and know what does or doesn’t work for you personally is another essential component of the Paleo lifestyle. You can be Paleo and not tolerate bacon (gasp) or meat at all, or heck even fruit. You just need to know what your body likes, or doesn’t like, which sounds simple, but can also take some time to learn. That being said, there are certain kinds of alcohol that are just better than others. Red Wine, for instance, is almost always the first alcoholic beverage that comes to mind when thinking of “safe drinking,” simply because of the amount of scientific research that have pointed to the health benefits and high antioxidant content of red wine. When choosing a red wine, however, it is important to look for Non-GMO wines, which can usually be found in a Whole Foods, or Organic wines, as grapes are on the dirty naughty list of being highly dosed in pesticides. Furthermore, many red wine companies use food colorings in their wines. If you can, look for wines that are produced out of New Zealand as they have stricter laws on GMOs and the use of pesticides and chemical agriculture. Champagne is a similar story to that of red wine. This recipe does not actually use red wine; it uses white. White wine is still a much better choice than say, indulging in a beer (gluten, GMO), or hard liquor, which is extremely toxic to your liver. It should also be noted that drinking in moderation is another consideration when following a Primal lifestyle. It’s important to know your own personal limit, and try not to either exceed that or better yet, cut yourself off at the 2 drink maximum. 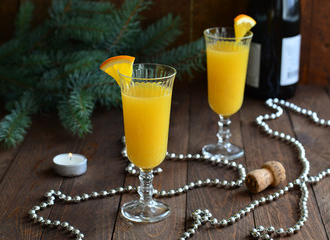 A delicious and elegant, Primal twist on a classic holiday adult beverage. 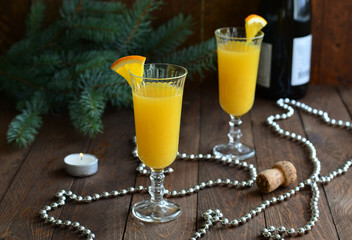 Pour into champagne or wine glasses and enjoy with fresh organic orange slices. if using the sparkling water and mango juice mixture, save the sparkling water for when you take the pitcher out of the fridge. Please note this post contains affiliate links. You can read our Affiliate Disclosure here. The Christmas season is filled with holiday traditions and excited anticipation of gift-giving, gift-opening, and food-chowing for all who celebrate. Arguably one of the best parts of the holiday season are the food, and the drinks! If you’re trying to keep an eye on the amount of sugar and “junk” you consume though, it can definitely be really difficult to keep things in check if you aren’t aware of how to create delicious and healthier substitutes for your holiday favorites. 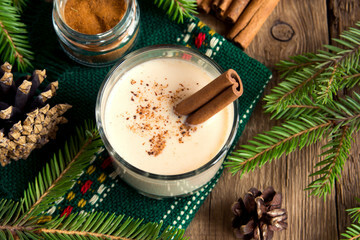 Egg nog is one of those beverages that seems to only surface around the Christmas holiday, often enjoyed at Christmas parties, work parties, or with family. But traditional egg nog isn’t so healthy as it is usually made with heavy cream (from conventional, hormone filled, antibiotic and GMO cows,) and factory farmed eggs, and combined with a ton of GMO sugar. While there are Organic varieties of egg nog in stores, it certainly isn’t Paleo friendly. Egg nog really is not that difficult to make! Or even that difficult to make Paleo-friendly. This recipe for Paleo Egg Nog is a cinch to whip up at home, and only takes a couple of minutes! It should serve 3-5 people. Pour the carton of coconut milk in a food processor or blender (the Aroy D brand is perfect for this recipe because it is extremely thick, similar to a heavy cream. We cannot guarantee this recipe will work with other coconut milk brands). Add your egg yolks, sugar, salt, nutmeg, and cinnamon. Blend on high til everything is combined. Chill and serve! Top with SoDelicious Coconut Whipped Topping or make homemade coconut cream if you desire a whipped topping. Chinese food is most often synonymous with New Years Eve. It is undoubtedly one of the busiest nights of the year for Chinese food restaurants, and if you’re following a Paleo diet or you are trying to eat healthfully this holiday season, springing for Chinese takeout may not be the best option. There is good news though! 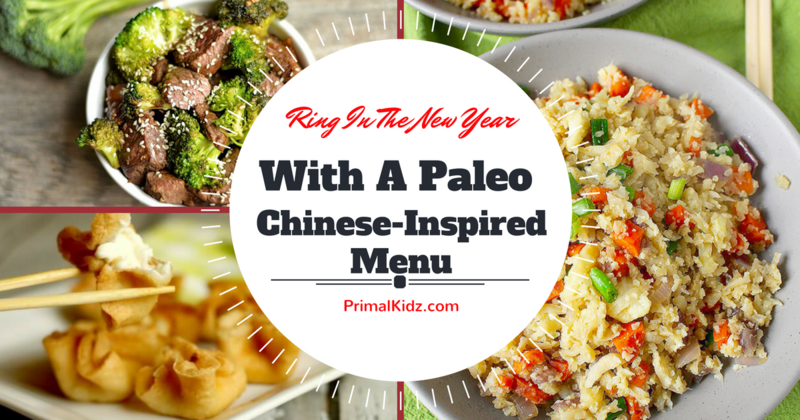 Tons of Paleo bloggers have created delicious, Paleo friendly versions of Chinese food that you can whip up in a jiffy on New Years Eve so you’re not feeling so left out while your friends and family are chowing down on fried rice. 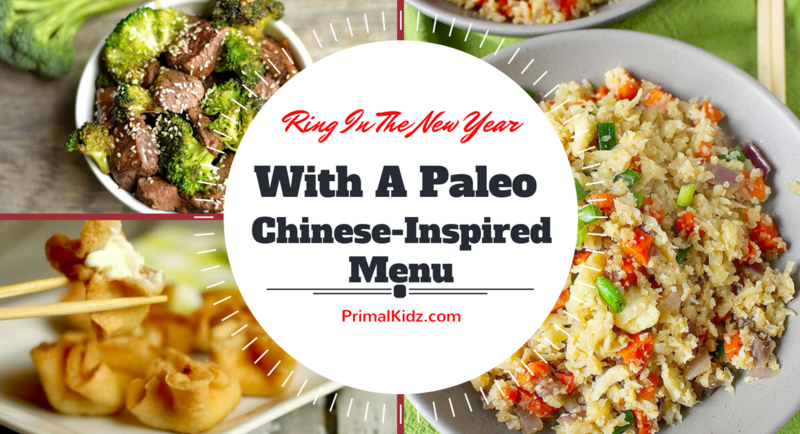 We’ve compiled several of the yummiest looking Paleo Chinese food recipes on the web, and created a sample menu you can use for New Years planning. No Googling and scouring for recipes that look appetizing, and trying to figure out what you will serve with what, because we’ve done it all for you! 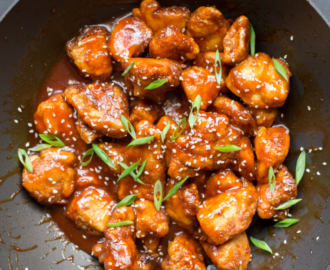 Sweet and sour chicken is technically more of an American interpretation of Chinese food than an actual Chinese dish; it is nonetheless regarded as a Chinese dish in America and is also an extremely popular one at that. We chose The Domestic Man’s recipe because photos don’t lie, and that sweet and sour sauce looks sweet, sour, gooey, and sticky! (Which, we all know, is the best kind of sauce!) While he doesn’t add any veggies to his sweet and sour chicken, we encrouage you to load your plate with colorful veggies like red peppers and snap peas to compliment the sweet and sourness of the chicken. Head on over to The Domestic Man to grab his mouthwatering recipe! It goes without saying that you can’t eat some New Years Chinese food and not have beef and broccoli. Beef and broccoli go together like..peanut butter and jelly. 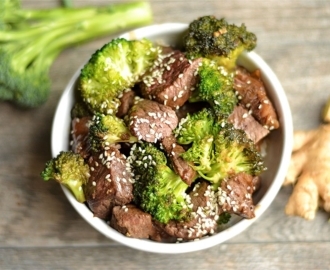 This easy recipe for Ginger Beef & Broccoli Stir Fry by Wholesomelicious takes only twenty minutes to prepare before you’re on your way to enjoying some serious deliciousness! Lo Mein noodles are one of those Chinese classics you just can’t forget on New Years. Noodles however, are definitely NOT Paleo! 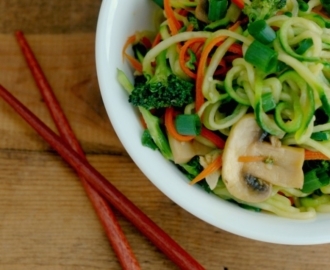 No worries though, because spiraled veggies serve as a fabulous substitute for noodles in this recipe for Paleo Veggie Lo Mein Noodles by Raising Generation Nourished. This recipe can also be thrown together in as little as 15 minutes, without sacrificing on taste. 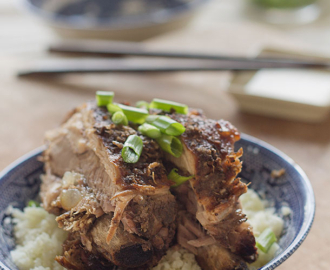 For a true Paleo Chinese food experience, visit Raising Generation Nourished to get the deets on this delectable recipe! Chinese spare ribs are another classic, favorite dish among chinese food aficionados, but traditionally made Chinese spare ribs are usually doused with GMO soy sauce and a whole host of other non-Paleo friendly ingredients that are also loaded with MSG. This recipe for Paleo Chinese Slow Cooker Spare Ribs by Slim Palate is 100% Paleo compliant though, and uses a combination of Chinese 5 Spice, coconut amines, apple cider vinegar, dry white wine, honey and tomato paste to create that classic Chinese spare ribs flavor. The ribs are also browned first and then placed in the slow cooker all day to create a succulent and juicy meat that falls off the bone. This is a great recipe to start in the morning and let cook all day while you prepare the other dishes in this menu! The recipe would also work well served over cauli-rice like pictured, or served alongside the Paleo Fried Rice recipe below. This wouldn’t be a Chinese food roundup without a fried rice recipe included! This recipe for Paleo Cauliflower Fried Rice by Jay’s Baking Me Crazy won’t leave any room for disappointment either! It is a very simple, quick recipe you can whip up and then cover and set aside while you prepare the more involved main course. 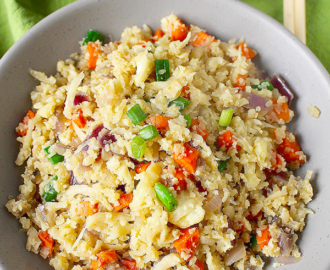 The taste and texture of this fried cauli-rice recipe is incredibly similar to traditional fried rice, but is chock full of healthy ingredients instead like cauliflower (duh), carrots, onions, and green onions. This recipe also tends to go heavier on the ginger, but feel free to adjust seasonings to your personal liking! Head on over to Jay’s Baking Me Crazy for this awesome recipe! If you’ve stayed with us so far, you will surely not be disappointed! You probably didn’t think Wontons were ever going to be an option while eating Paleo, did you? Wrong. They totally are on your New Years menu this year! This recipe for Paleo Wontons by Life Made Full is nothing short of a miracle. The crispy dough is replicated by using tapioca flour, almond flour, egg whites, and coconut milk, which is then fried in palm shortening. 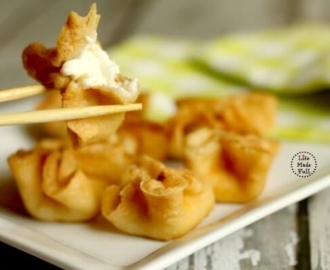 While this image does depict the wontons filled with cream cheese (which is #NOTPaleo), you are free to fill your wontons with whatever you like! (If you want a Paleo-friendly version of cream cheese, we recommend using cashew cream cheese instead.) Head on over to Life Made Full for this mouthwatering recipe! After all this Paleo friendly Chinese-inspired fried food, we had to culminate this roundup with a dessert recipe of course! 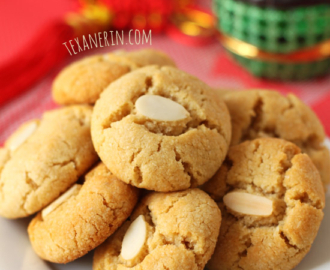 These Paleo Chinese Almond Cookies by Texanerin Baking may not be 100% “Chinese,” but they are pretty darn close when it comes to Paleo baking. These cookies are chewy, delicious, and satisfying! 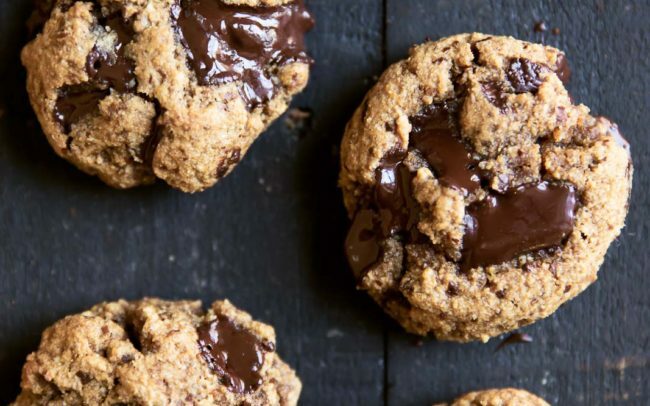 Even if you are a cookie monster, you won’t feel guilty indulging in these cookies because they are full of healthy, filling ingredients like almond flour, coconut flour, coconut oil and maple syrup. Mango pudding is a traditional Chinese dessert that will be sure to please everyone. 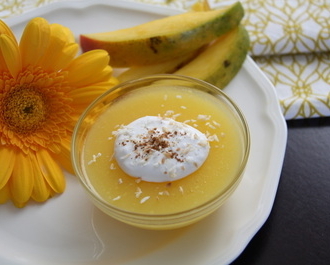 This recipe for Paleo Coconut Mango Pudding by Eat, Heal, Thrive is a close and healthy representation of the dessert traditionally enjoyed in China. This recipe also happens to be AIP (Autoimmune Paleo) friendly as well! It is an extremely simple recipe made with only a few ingredients: gelatin, coconut milk, mango chunks and water (a little bit of honey is optional too!) so you really don’t have to worry about indulging in too much sugar at the end of your meal. Head over to Eat, Heal, Thrive to get the full recipe! This post was written by Brian Kavanagh, AKA, The Sophisticated Caveman, and originally appeared on his blog. 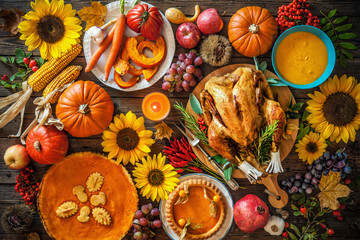 Thanksgiving is upon us, a holiday associated with gratitude, family, and over-indulgence. 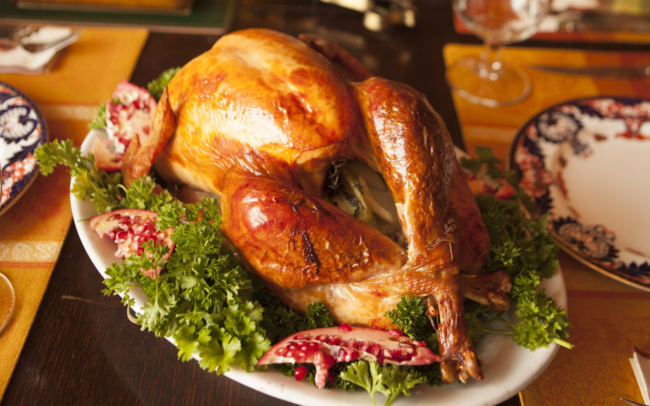 Dry brining turkey is convenient because it doesn’t require a vessel to house the turkey while brining. It also makes for an incredibly tender and moist turkey that isn’t mushy. 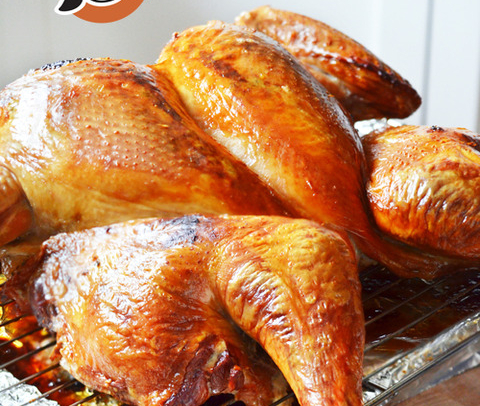 This turkey recipe butterflies the bird and incorporates butter or ghee in the cooking process, making for a deliciously crispy yet succulent turkey your family will be sure to love! This recipe for stuffed Turkey breast is an unusual twist on the Thanksgiving classic bird. 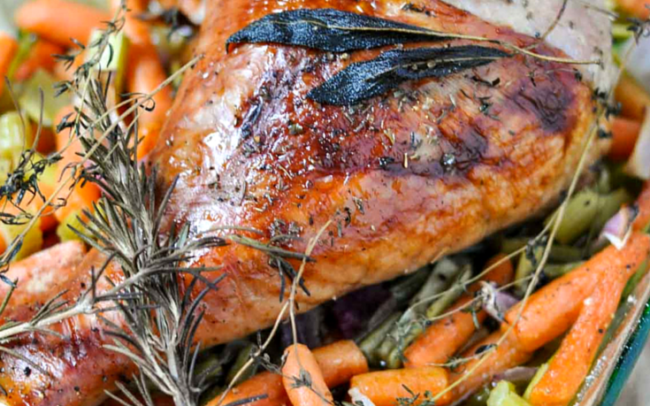 It incorporates a variety of holiday ingredients like figs, bacon, celery, onion, rosemary and sage to give this bird a ton of flavor! Having a small Thanksgiving this year? This recipe for roasted turkey legs with all the classic Thanksgiving herbs is perfect for a smaller, quieter holiday without all the massive prep work! 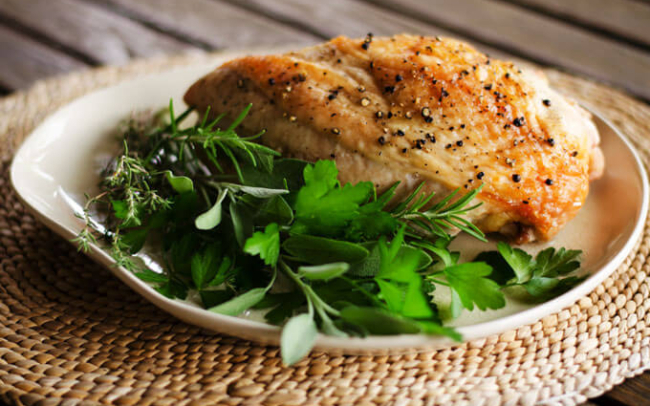 This recipe for simple Paleo roasted turkey breast is another easy recipe to use for Thanksgiving if you are having a smaller holiday. 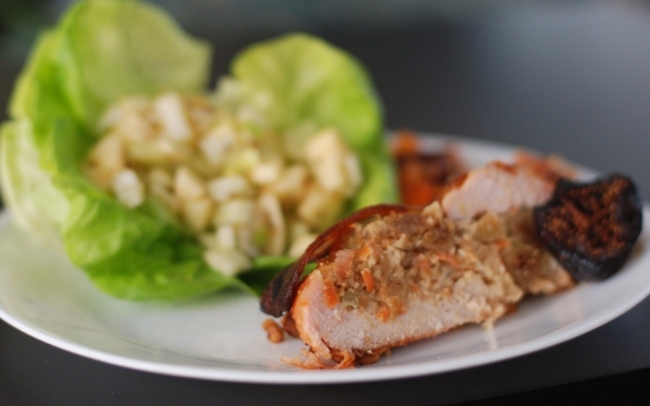 This stuffing recipe will have you believing it can’t possibly be gluten free, let alone Paleo. It incorporates all the fall favorite flavors, like ground pork, sage, thyme, rosemary, diced apples, cranberries, and pecans. 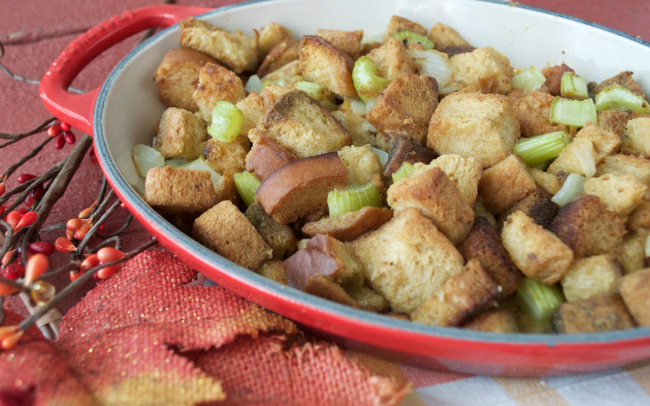 Another stuffing recipe using classic fall flavors like apples, pecans, celery and onions, this stuffing recipe is made in the slow cooker – leaving your oven free for that giant turkey! 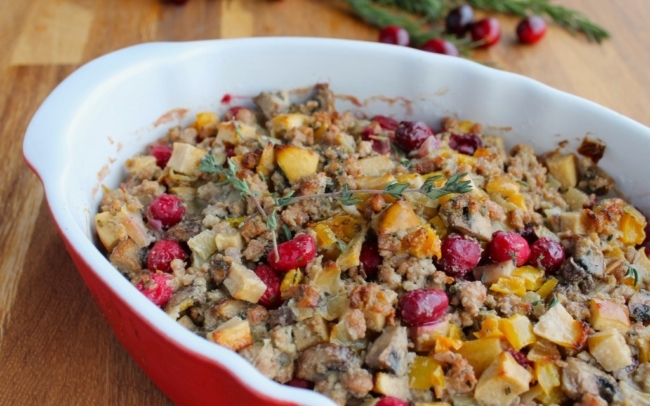 This stuffing recipe is a Paleo take on the classic stuffing recipe. It looks and tastes like the homestyle stuffing yo mama used to make! This recipe uses dates and apples to sweeten it a bit. This recipe for Sausage and Cauliflower Rice Stuffing is a true Paleo recipe that can also be made Whole30 compliant if you use ground pork. 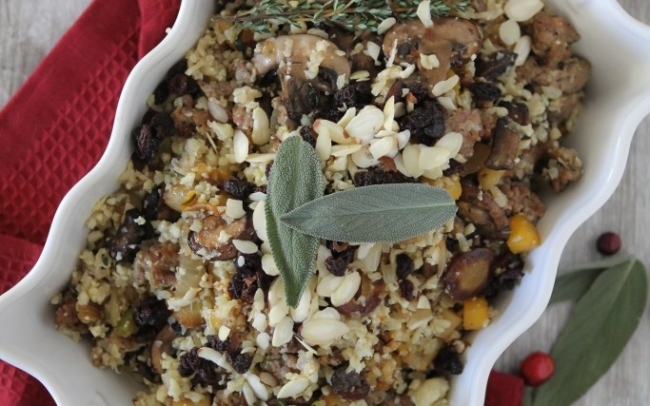 This unique recipe utilizes cauliflower rice, parsnips, leeks, collard greens, currants, and slivered almonds for an eclectic variety of ingredients, making it extremely nutrient dense as well! 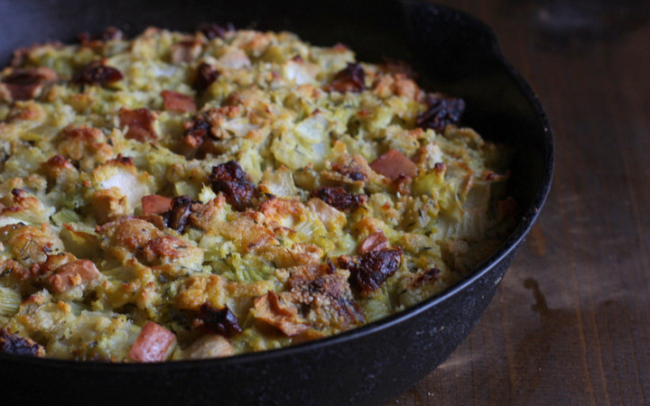 This is the closest Paleo stuffing recipe you will get to the real deal. This recipe uses a grain free bread recipe, along with the traditional onion, celery, and chicken stock to pull everything together. This recipe screams Thanksgiving! 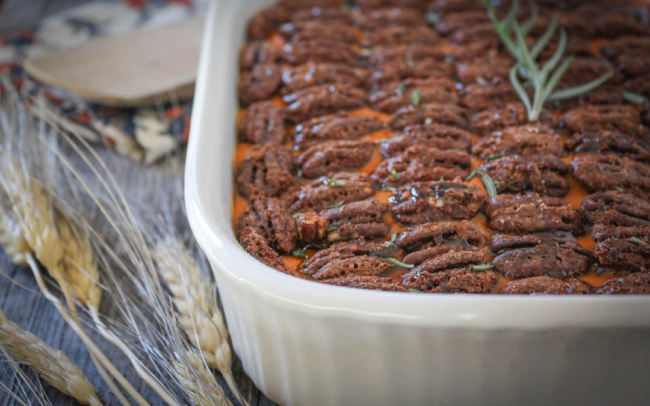 Most Thanksgiving yam recipes are topped with marshmallows, which are so NOT Paleo, but this recipe uses candied pecans to top the insanely delicious and creamy whipped yams. 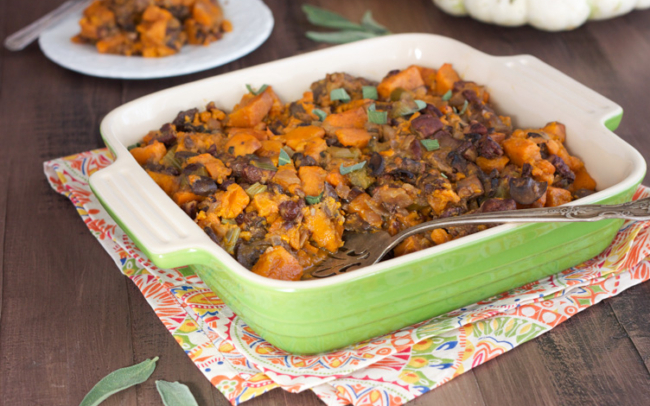 Sweet potato casserole is a wonderful side option for a Paleo Thanksgiving. 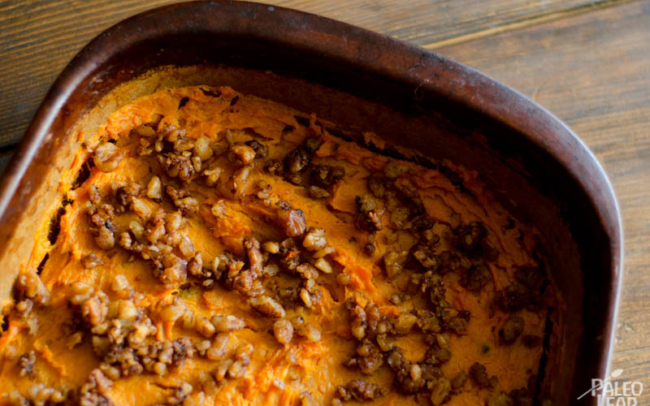 Sweet potatoes are much more nutritious than regular white potatoes, and this colorful dish is made extra sweet with chopped cinnamon walnuts. 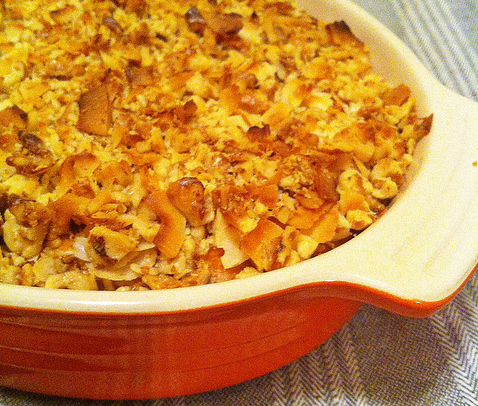 Another sweet potato casserole recipe, this one uses walnuts and coconut flakes as a topping to the casserole. Sweet potatoes are sure to please any crowd! 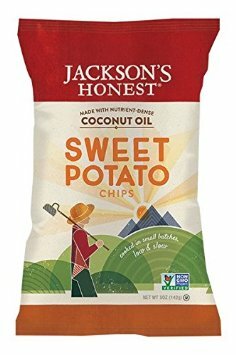 This recipe for Hassleback sweet potatoes is a unique recipe one doesnt often see for Thanksgiving, but is delicious nonetheless! It is also much simpler than having to peel, cut, and mash all those sweet potatoes! These faux “mashed potatoes” are a classic Paleo version of mashed potatoes with an added twist: turnips. Turnips are included in the recipe, but are optional if you want a more traditional Paleo mashed fauxtato. Beets are a classic Fall vegetable, though not often seen at the Thanksgiving table. 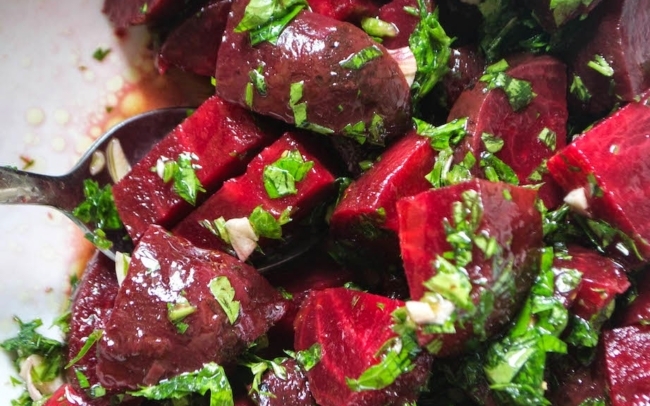 Why not jazz your traditional holiday menu up a bit with this recipe and throw in an autumn beetroot salad with garlic and parsley? Thanksgiving is full of orange foods! 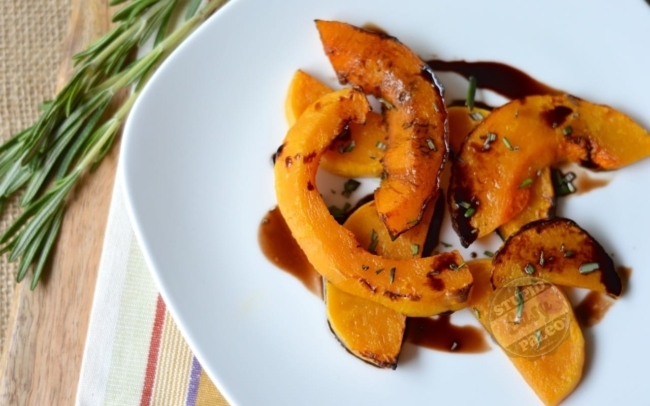 Butternut squash is a lovely vegetable to have at your Thanksgiving dinner, and this recipe has a gourmet flair to it with the help of the rosemary infused balsamic glaze. Creamed spinach just makes you think of a fancy steakhouse, doesn’t it? It can also be a side dish frequently seen during the Fall holiday season. 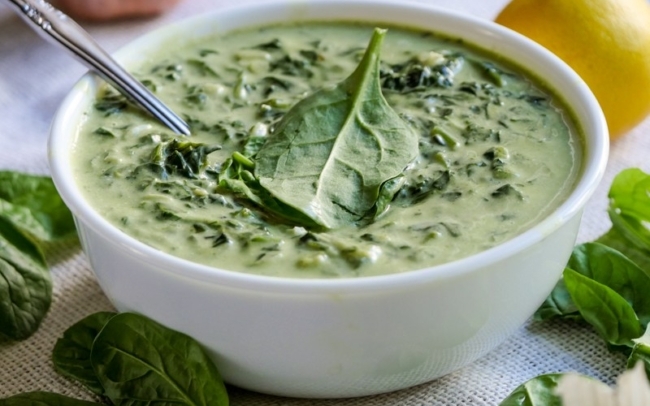 This recipe Paleo-fies the recipe by using coconut cream rather than traditional dairy; though that doesn’t mean this paleo creamed spinach isn’t simply amazing! 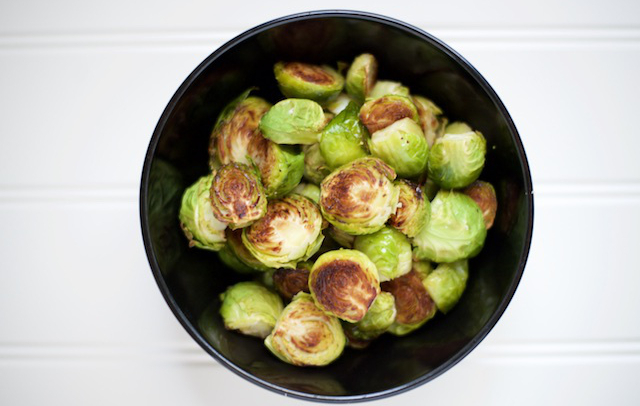 Brussel sprouts may not be the favorite dish at Thanksgiving, but it certainly is a healthy one! This recipe brings out the best flavor in brussel sprouts with the slight nuttiness of avocado oil and ghee paired with pink salt. 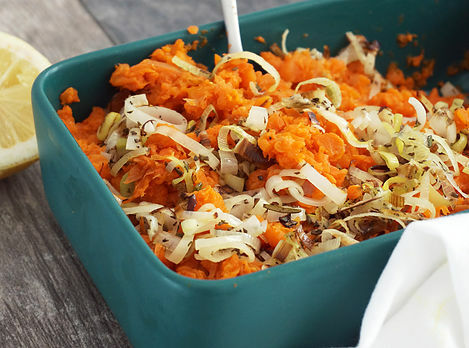 Mashed carrots are a great lower carb options than starchier veggies like potatoes. This recipe is versatile and delicious, and is topped with leeks and dried rosemary for a savory layer atop the sweetness of the carrots. 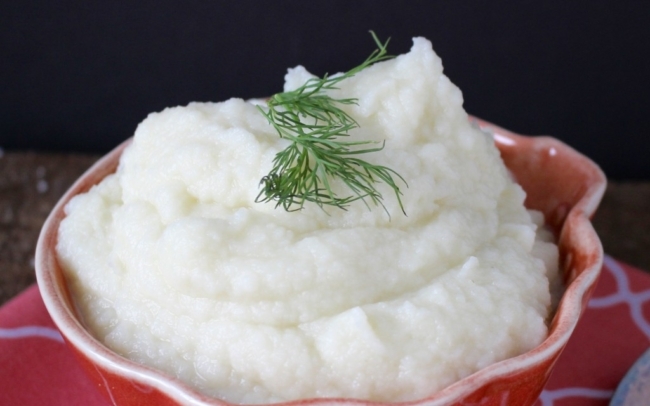 A purely Paleo side dish, mashed cauliflower is another fabulous alternative to white mashed potatoes, and is much lower carb yet does not sacrifice on texture! Butternut squash paired with maple and mustard – need we say more? Sweet and slightly tangy, this dish would be an absolute hit with any kids! 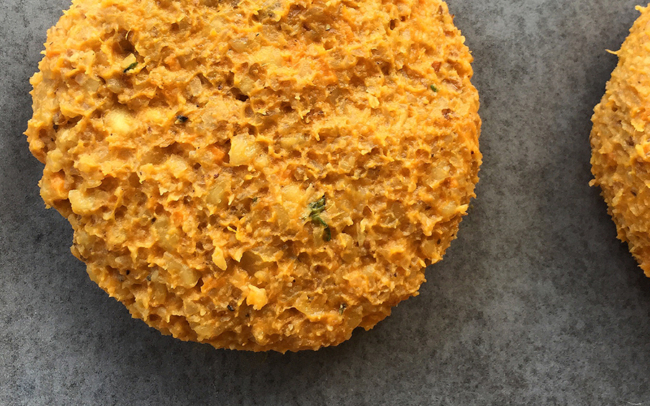 An interesting take on the classic biscuit, this biscuit recipe uses fresh roasted sweet potatoes and ground walnuts as the flour to create a perfect Fall Paleo biscuit. 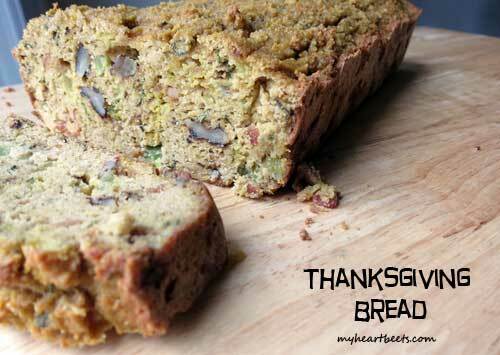 Thanksgiving stuffing…in a loaf of bread! That’s what this Paleo bread tastes like. You can smear cranberry sauce on it or cube it up and even try toasting. It subs well for the stuffing and is a cinch to whip up. 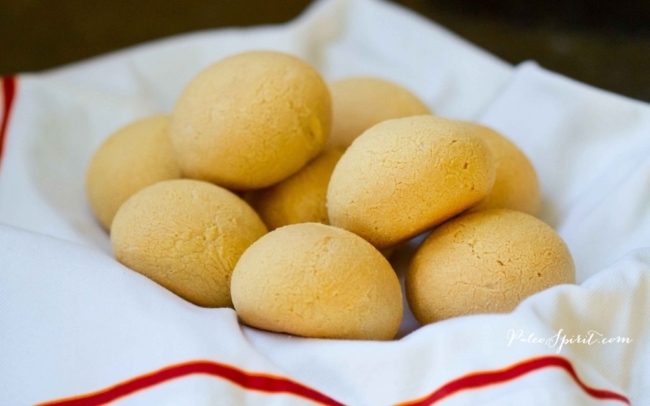 This recipe for Paleo dinner rolls is right on the money. Tapioca starch is a wonderful Paleo friendly flour that lends a stretchiness to Paleo doughs similar to traditional gluten filled flour. This recipe uses a few simple ingredients that work together to create a Paleo dinner roll recipe that can stand up to bread lovers everywhere. 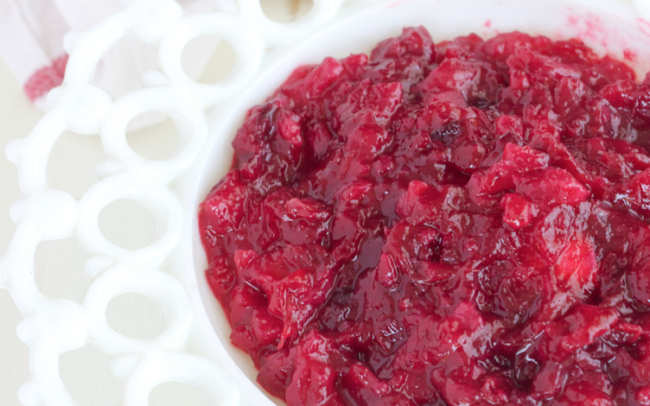 Thanksgiving would just not be Thanksgiving without the cranberry sauce! Even if you’re not a huge fan of the red stuff, this recipe might sway you to the other side. 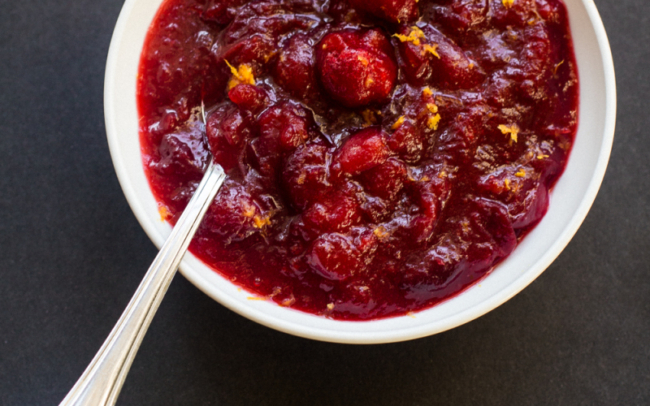 This recipe for Paleo cranberry sauce is made with fresh cranberries and plenty of natural sweeteners like fresh squeezed orange juice, coconut sugar, a hint of ginger and honey, so you can be sure it will be hit with everyone. This Paleo cranberry sauce adds a sweet and smooth twist to traditional cranberry sauce, as it uses pears and honey as the natural sweeteners. A hint of ginger gives the sauce a bit more depth to its flavor and gives it some holiday zip. 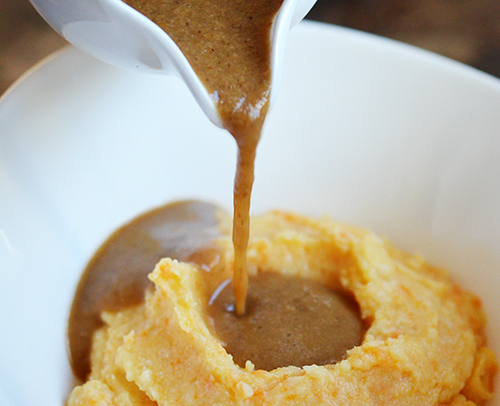 Gravy is an absolute necessity at Thanksgiving, Paleo or no. But we prefer Paleo. And this recipe is almost Paleo, with the exception of the whole cream in the recipe. However off the record, coconut cream or homemade cashew milk could be a good substitute for a fully Paleo gravy. Most broth in packages is not so healthy. Even the “Paleo” versions, while they may be Paleo compliant and way healthier, wouldn’t you still reaallyy rather have homemade? 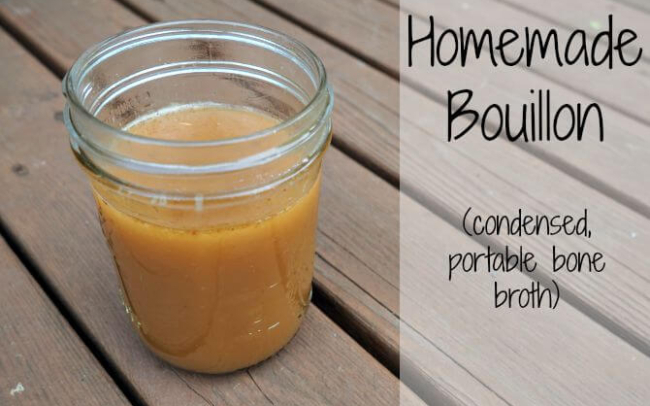 This recipe for homemade bouillon cubes is super simple and will keep for months on end until ready to use. It would be fabulous paired with some leftover turkey! 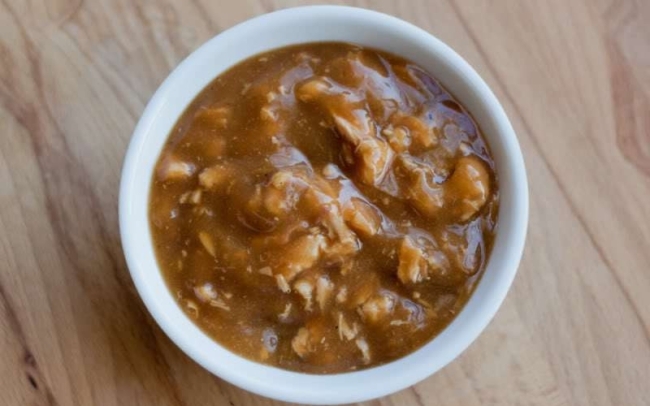 This Paleo recipe for Umami gravy is packed full of ingredients that boost umami: bone broth, tomato paste, mushrooms, and fish sauce. The ingredients may be surprising for a Thanksgiving meal, but the flavors coalesce and elicit strong gravy-lovin feelings. 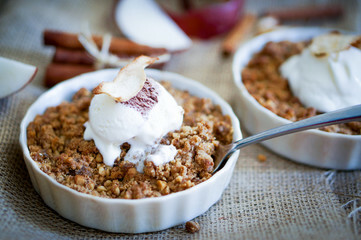 Fall and apple crisp go together like birthday and cake. This apple crisp is completely Paleo though, so it is gluten free and grain free, and bursting with Fall flavors like maple sugar, butter, apple pie spices, coconut flour, and blanched almond flour. Nothing is more decadent than a simple chocolate silk pie, but the ingredients in it are usually full of sugar and other junk. 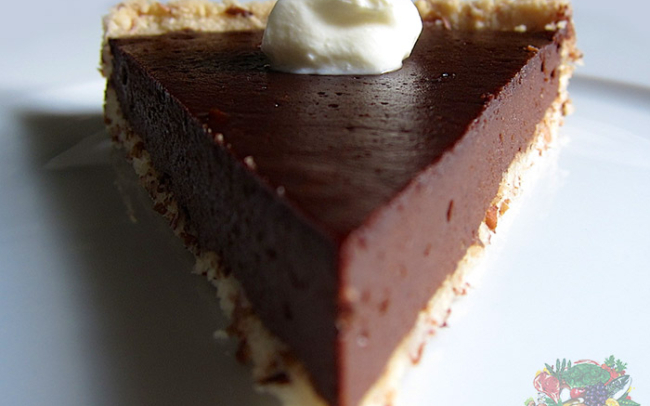 This chocolate silk pie however, is actually one of the healthiest pies you can eat. 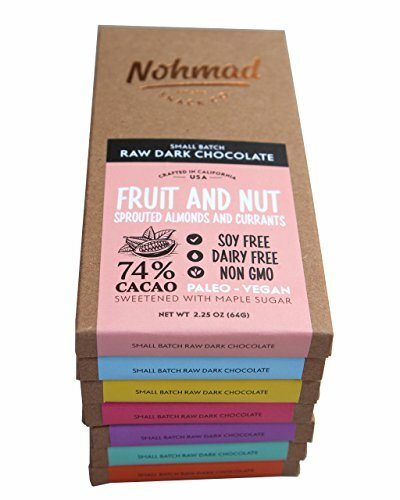 Made with protein rich eggs, healthy fat from coconut milk, fiber from almonds and dessicated coconuts, natural sugar from dates, and antioxidants from cacao, literally almost every ingredient has some health benefit or nutritional value to it. Yayy for Primal desserts! 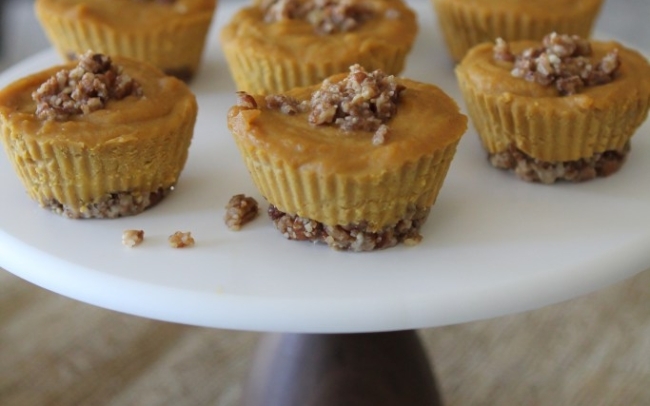 Another dessert recipe that actually contains nutrients, these Paleo pumpkin pie bites contain real pumpkin, cashew butter, cacao butter, almond flour and ground pecans. 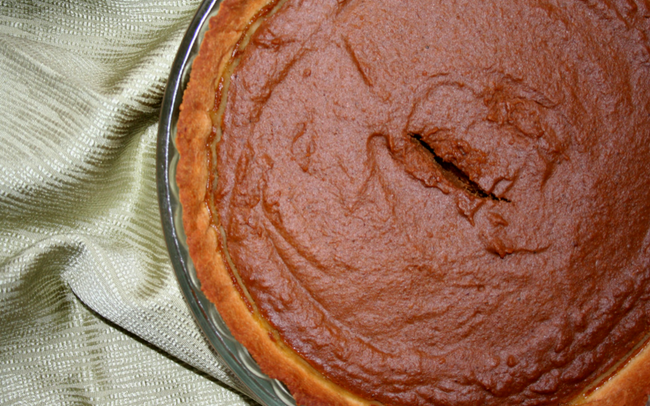 Pumpkin pie on Thanksgiving is a given, so why not make it a little healthy? Pumpkin naturally contains lots of Vitamin A and C, and is full of fiber. When you pair that with eggs, coconut milk, classic pumpkin spice, raw honey and maple syrup, you have a real food recipe that your family and guests will savor. Pecan tarts are a classic dish down south, and good old southern comfort food during the Fall holiday season is the perfect ending to a meal. 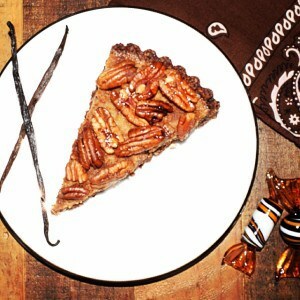 This Paleo pecan tart uses heaps of pecans, eggs, dates, molasses, butter, and coconut flour to make one singularly sumptuous pie. Think it’s hard to find organic food in your local grocery store? Grab our Organic food cost comparison guide to see how easy it is to access organic, Primal food! Brian Kavanagh, also known as The Sophisticated Caveman, is a creative professional with a special place in his heart for food. After struggling for years with weight loss, he recently discovered that he could still satisfy his passion for cooking amazing meals while using clean, healthy ingredients. 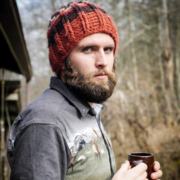 He shares recipes and lifestyle tips on his blog, The Sophisticated Caveman. You can also follow Brian on Facebook, Instagram, Pinterest, and YouTube. Whether you are eating a Paleo Diet or whole foods based diet or not, Halloween trick or treating presents the same problem to most parents: the motherload of candy. 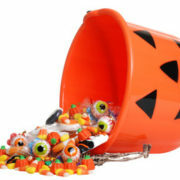 Even if you are game for your child eating a couple Snickers and Twix bars on Halloween, the mountain of candy that remains after trick-or-treating often troubles parents as we deal with what to do with the aftermath. Deciding to let your children eat candy is a personal choice, but what if there were healthier alternatives that taste just as good? If you are committed to being Paleo, and allowing your kids to eat conventional candy and chocolate is just out of the question, fortunately you are not without options! 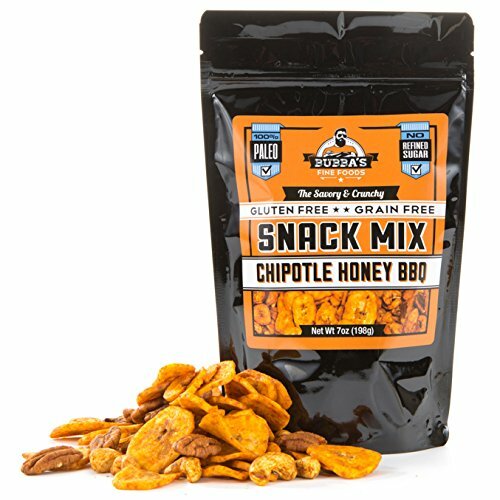 Many Paleo friendly brands have emerged over the past year or two, which means there is a more enticing selection of Paleo treats and Paleo snacks available that just wasn’t there a few years ago. 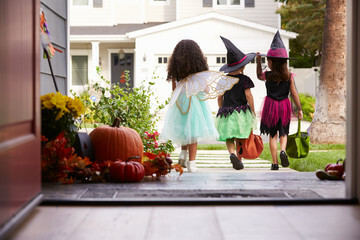 Allowing your children to still partake in trick or treating, and then simply replacing their candy with these Paleo treats instead will leave your kids jubilant that they got to still dress up in costumes, go trick or treating with their friends, AND still indulge in some (healthier) treats. If you do allow your kids to have a couple bites of the “forbidden fruit” on Halloween, you don’t have to assume the ‘mean parent’ role and just take away the rest of the candy and leave them with nothing. You can play a fun game of Switch Witch, and either replace the remaining candy with a special gift, or opt for some of the delicious and kid friendly Paleo treats instead! 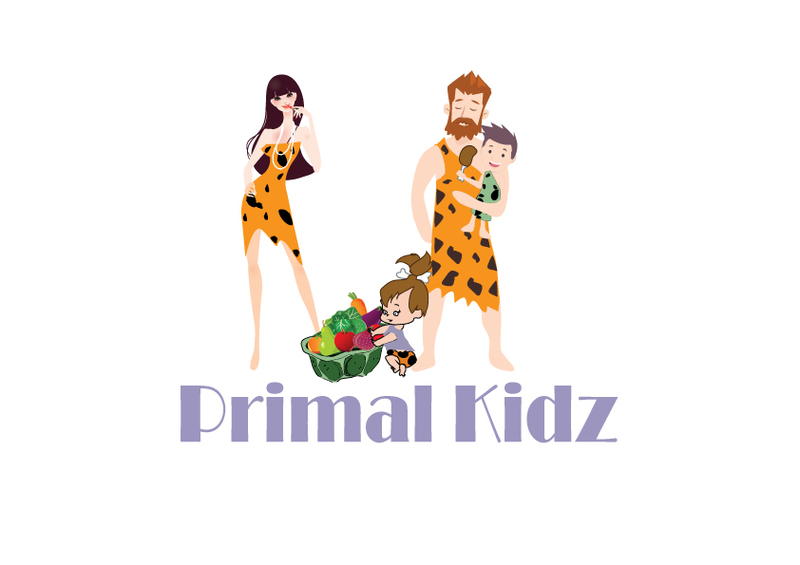 This post was formatted for Primal Kidz Mag, and was originally written by Stephanie and appeared her blog, Original Eating. I go through this every year. The aisles of special Halloween candy that you have to avert your eyes from. I know, and I totally get it. I also know that willpower (and being an example for others) is like a muscle that gets stronger and stronger as you flex it. This Halloween, maybe you’re giving thought to doing a more healthy alternative of the holiday, but you want everyone to have fun and not be robbed of sweet treats, right? 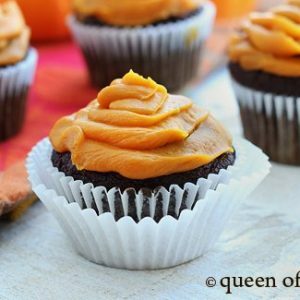 With this list of spooky Halloween themed treats that are also Paleo friendly, you can have your cake and eat it too! 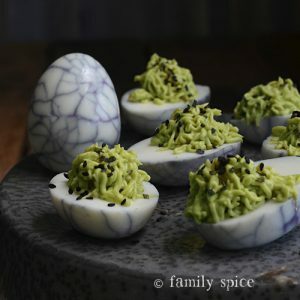 When I saw these avocado and wasabi deviled eggs from Family Spice, my jaw dropped. The creativity completely amazed me and the flavors sound delish! Using an interesting and easy technique to create a “spider web” effect, the originality of this recipe had me sold on the number one position for our Top 10 Paleo Halloween Treats! 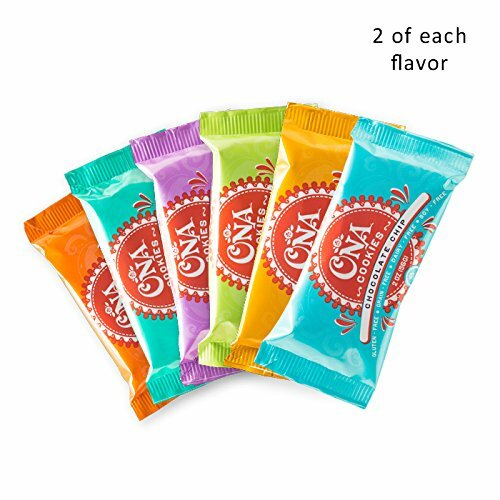 These flavors are best suited for those who are longing for a spicy and savory treat with the overwhelming sweets found during Halloween. YUM! 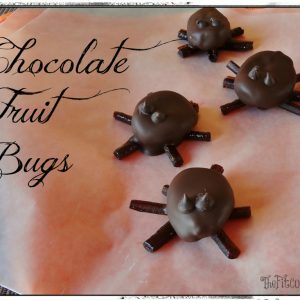 These Chocolate Fruit Bugs by The Fit Cookie are super easy to make and are a great project to make with your kids! With simple ingredients like pure fruit leathers, dried apricots, and chocolate chips, you can’t go wrong with this adorable and slightly creepy Halloween treat! 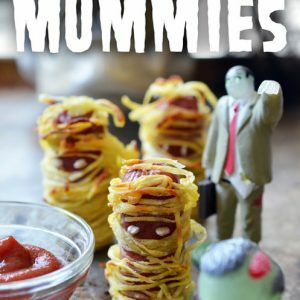 Sometimes you need to serve up food that isn’t sugary sweet, but still considered a spooky treat! These Paleo Yummy Mummies from Nom Nom Paleo give a convenient snack without any flour at all! For best mummy quality, choose an organic, grass-fed, and nitrate-free hotdog to become your goulish treat. 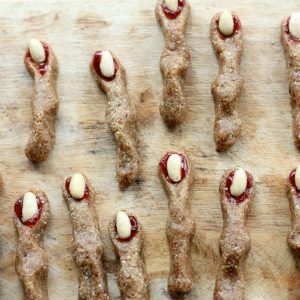 In my opinion, no Halloween is complete without the frightening treat known as “Witches fingers.” I LOVE these cookies! This recipe is from The Full Helping, where you not only have a lovely recipe that is gluten free and grain free, but you have the added health benefits of raw ingredients that are bake-free! 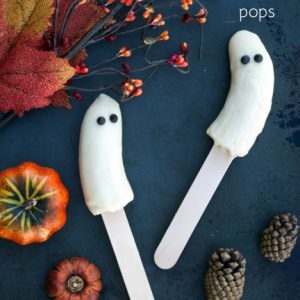 These spooktacular banana ghost pops from Plaid and Paleo are not only super adorable, but they are made with super healthy, whole food ingredients like bananas (duh), coconut butter, honey, and chocolate chips. Plus your kids will have such a blast making these little ghosts, they won’t even realize they are actually healthy! 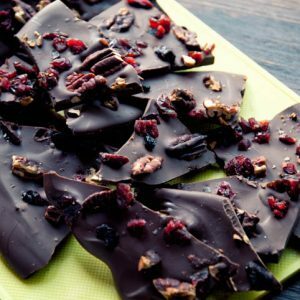 This sweet and salty dark chocolate bark from Paleo Leap is a smooth, quickly melting, yet thoroughly deep cocoa flavour envied by all the dark chocolate bars on the shop shelves. This recipe combines the best flavors of fall, utilizing pecans and dried cranberries or cherries for the perfect sweet and salty combo that is so beloved by chocolate fans. To put it simply, these grain-free chocolate cupcakes are perfect. Found over at Simply Quinoa, these cupcakes are everything that you envision when you think of chocolate cupcakes: a springy cake texture that’s still moist and tender, with a rich chocolate flavor, and all topped with a sweet vegan icing. (And you’ll never guess what is icing is made from!) These babies would be great for any occasion, but the fiery orange icing and deep brown (almost black) color, makes them perfect for our Halloween festivities. Chewy, sweet, and bake-free, these raw treats from Girl Gone Raw are a quick treat that the kids can help shape too! 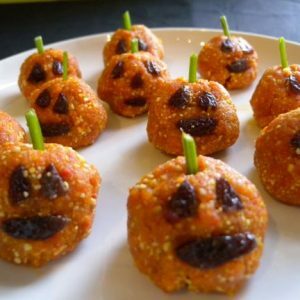 These happy little pumpkins are easy to make, transport well, and are healthy! Shhhh! Don’t tell anyone! Sometimes you need something extra spooky! 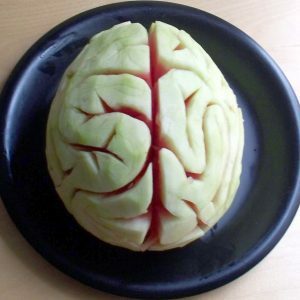 It’s hard to beat a recipe that includes the instructions “carve channels out of melon to resemble cortical folds.” Found over at Instructables By Scoochmaroo, I just had to share the highlights of this Halloween treat that even vegans will drool over! Slicing into melon will never be the same! This is a great one to bring to the office and amaze your coworkers ? Nothing says PARTY like a plate full of eyeballs! For a frightening flair whip up these Halloween treats found at The Things We’ll Make. 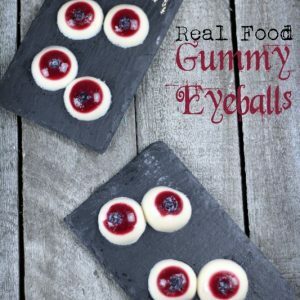 Made with skin loving ingredients like gelatin, coconut milk, and berries, these eyeballs will surely get your guests eyes poppin when they realize these creepy treats can actually make their skin glow and hair grow! 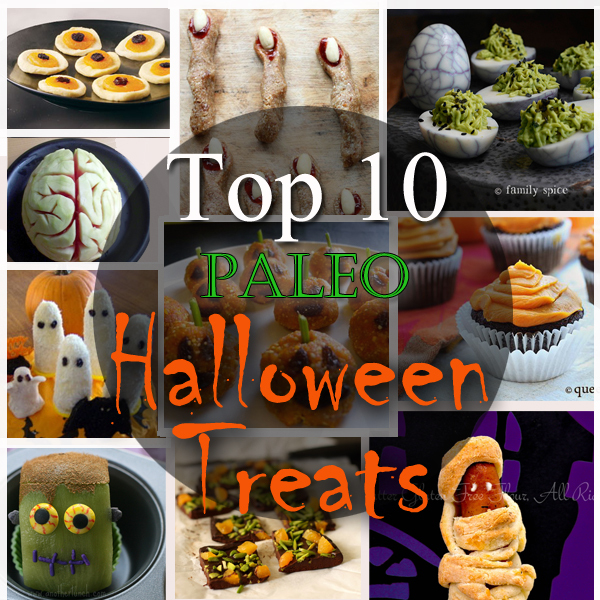 For other cool Paleo treats and snacks your kids will love on Halloween, check out our other post on Paleo Halloween treats, or find other Paleo snacks here. Stephanie helps overwhelmed and busy people lose weight without the pain! 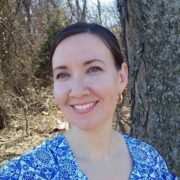 She creates recipes and programs for specific health needs such as hypothyroidism on her blog Original Eating. She is also the author of four bestselling books on the Paleo diet on Amazon. When we first started the blog I remember putting out this really old recipe (talk about a trip through the time warp machine) and someone asking what kind of apple did we recommend. Wow, I hadn’t even thought of that. 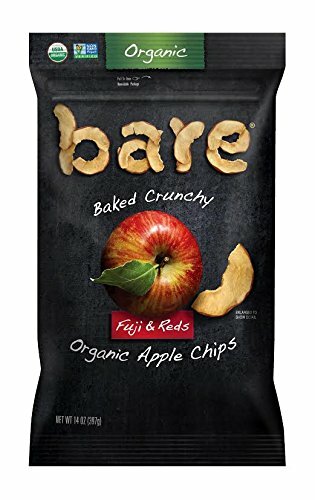 It’s so inherent to me to know the different types of apples, their flavor profiles, and how that works in cooking or baking application that I’d completely missed the mark on such an important factor. So, here’s where we teach you how to learn those things yourself, too! 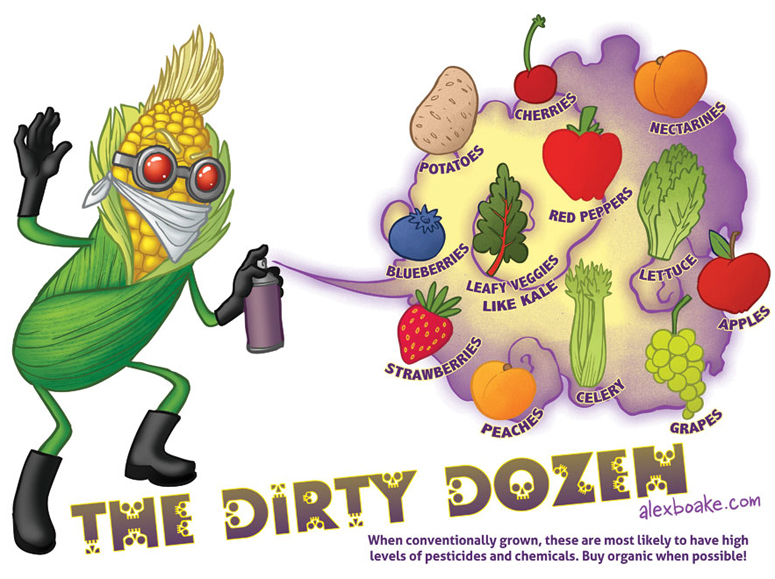 First: Beware apples are on the dirty dozen list! As noted in Alex Boake’s earlier guest post on our site, apples are not the kind of food to buy in the “regular” section of the grocery store. Organic apples can be found in bags at almost all local stores, and you won’t need to worry about distracting texture and taste of “protective wax” that the shiny perfect ones have. We personally patron local farms or farmer’s market for our apples. Farmers are often willing to part with “second” quality apples which have bruises or imperfections for less than half the cost. Recently we got an entire bushel of apples for $9, and frankly because they weren’t all ripe it made for fantastic cooking apples. Our kids are pretty picky about eating raw apples, however, so we did also purchase a half-bushel of first quality for $14. Compared to an equal quantity in a grocery store, we saved at least 75%! Now, this farm couldn’t advertise their apples as organic because they hadn’t gone through the costly and difficult process for that label, but we did ask about their practices and found that they avoided spraying with toxic pesticides. When trying to figure out if a farmer’s produce quality meets your standards, don’t be afraid to ask. For us, that means a few “bug bites” in some of our apples, which is something we actually look for now as a measure of how much pesticide a farmer actually uses. We can also gauge a farmer’s honesty in the amount he or she is willing to talk about the farm, and the kind of information offered. If you feel shamed or ignored when you ask a farmer about the quality of their product, it is probably because they have something to hide. Most farmers are proud of their hard work and are happy to talk about it with you! Store it at home in a chilled area (outside if it’s cool enough or inside if you have a cellar, or else in a refrigerator) until ready to eat or use. Keeping the apples cold will keep them crisp for as long as possible. If we leave our organic apples out at room temperature for more than a week not only do they start to soften, but we inevitably will get fruit flies and need to throw them out. No one wants that! Also of note, if you buy “second” quality apples that are already softening or partially bruised it’s essential to peel and cook with them as soon as possible. I wouldn’t recommend keeping them for more than a couple days, and they will need to be chilled during that time. We’ve learned this lesson way too often, time sneaks up on you and is not kind to bruised apples! What purpose are you looking to use your apple for? If you intend to cook with it, some varieties, such as Granny Smith or Jonathan are ideally suited for it while some, such as McIntosh, will not hold up at all. How long do you intend to keep your apples? Golden Delicious are notorious for bruising and rotting early while others, such as Fuji, could be kept in a cool basement for a very long time. Do you prefer a tart apple or a sweet one? Stacy’s favorite apple for use with Chicken Liver Mousse is the Pink Lady variety because it has a good balance of sweet and tart. If you’d prefer a sweeter apple, Gala might be your choice. For a tarter apple, Gold Rush would be a good choice. Braeburn – An excellent multipurpose apple that balances sweet and tart and is tasty to eat raw while it holds up well in baking. Cortland – A squat, soft apple, similar to a McIntosh, but firmer and sweeter and best suitable for cooking. Empire – A cross between McIntosh and Red Delicious, the Empire is a crisp, sweet variety with multiple uses that stores well. Fuji – Our boys’ favorite! Fuji are sweet and crisp and are best known for keeping for up to a whole year with refrigeration. Gala – Gala apples are small, soft and great for lunch boxes. They also make an excellent sauce. Ginger Gold – Ginger Gold are a Virginia native, so we often see them around here. Tart, crisp and good for eating, they’re also known to produce early in the season. Golden Delicious – Known for it’s distinctive yellow color and sweet taste, Goldens also have a thin skin, making them great for eating. Granny Smith – So tart, it’s almost sour! While some people enjoy the taste, Granny Smith is most commonly used in cooked apple recipes. Honeycrisp – Sweet-tart and crisp, Honeycrisp is a great apple for eating, and known to be extremely juicy. Idared – Idareds are very mild in flavor and not considered great for eating, but because they sweeten when heated they are perhaps the best cooking apple. Jonagold – Jonagolds are sweet-tart multi-purpose apples that are a cross of the Golden and the Jonathan varieties. Jonathan – A tart cooking apple that we have used as a base for our applesauce. McIntosh – Small, sweet and soft apple that’s great for eating or in sauces, but dissolves in baking. Red Delicious – The most popular variety of apple known for its dark red color and sweet flavor. Rome – Rome apples are sweet and juicy and excellent for use in cooking. When peeling and coring apples we have tried many tools. Spiral Slice and Peel Tool – We own one of these and honestly they can be a little temperamental. Unless it’s all lined up perfectly, you won’t get all of the core and the peeler might just gouge your apple (especially if it’s bruised or soft). But in a perfect world, these will easily get your apples to a state ready for saucing. Paring Knife and Corer – You can go all French chef and peel with a knife and core with a coring tool. This will take a lot of precision to pull off. Honestly, the best use we’ve found for the corer is to take out the core of a cupcake to fill it with chocolate, like we did in Eat Like a Dinosaur! Vegetable Peeler and Apple Slicer – The best tools we’ve found is to use a simple vegetable peeler with a metal apple slicer. 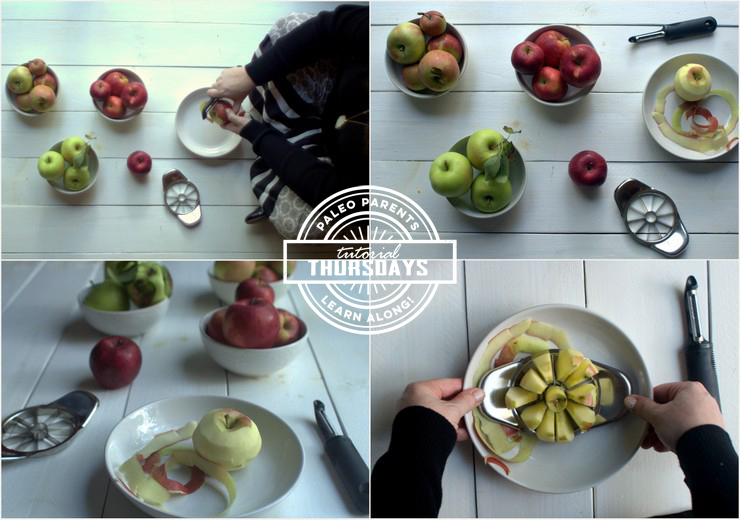 You’ll be left with a cleanly peeled apple and individual tiny apple sections, perfect for your tasks. We’ve gotten some questions about our applesauce recipe not really being applesauce. Well, here’s the thing: applesauce can have many forms. We love the taste of a roasted, chunky sauce so we use the oven to roast apples, which naturally caramelizes their natural sugars, then mash them with a potato masher. This leaves us with the perfect flavor and consistency for what we prefer. For you, maybe you want a smooth, more liquid sauce. If that’s the case, use a crockpot or stove top to cook it soft with water, then use a food processor to puree it smooth. You can also do this to our roasted applesauce; we do this too when we make our Apple Butter. 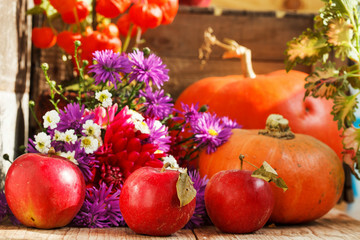 When fall arrives, go pick apples with your family at a farm that doesn’t use pesticides. It’s a bonding experience that our family loves! In fact, Cole was quite upset that our family missed out on picking a lot of the crops at you-pick farms this summer, because we were busy writing Real Life Paleo each weekend. 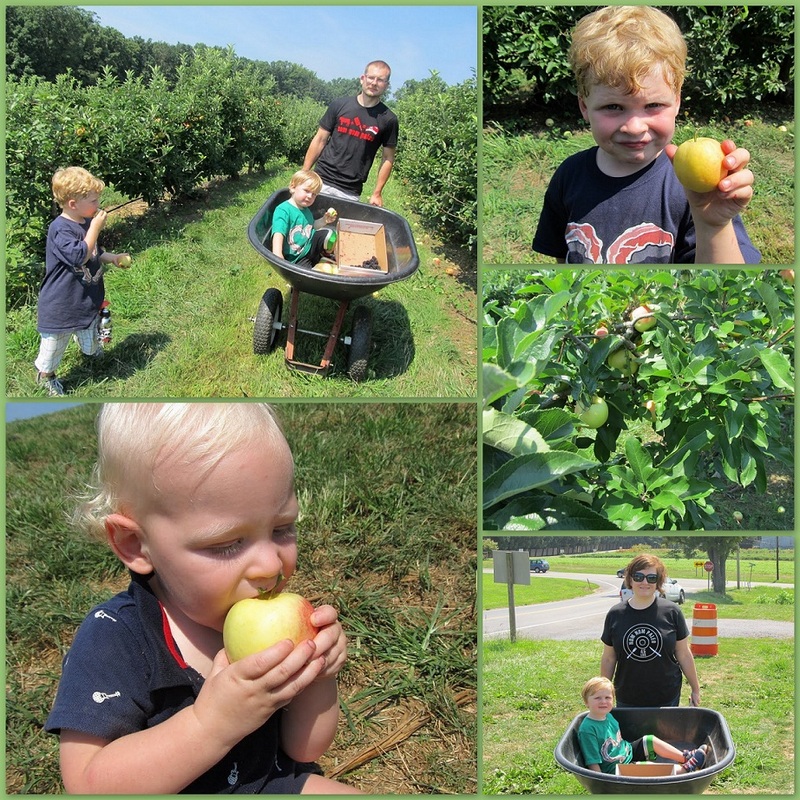 He was ecstatic to return to a farm, pick apples, and wants to make crispy apple chips with the many pounds we still have from two weekends in a row from visiting farms! It’s also much more affordable when you do the work yourself. Just this week Matt made batches of our Applesauce as well as the Apple Butter BBQ sauce in Real Life Paleo to share with my co-workers as a thank you gift for their hard work (see, I share all kinds of good info on Instagram). People were thrilled! 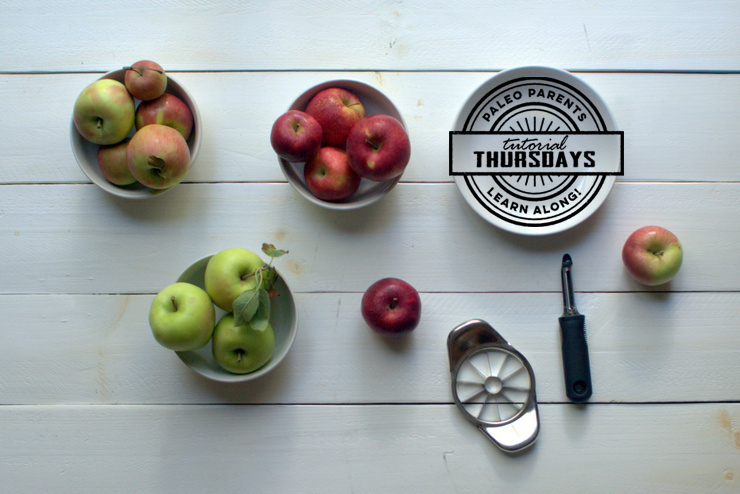 Because picking apples can be fun and affordable, and cooking them is so simple, it’s the perfect gift – great for planning ahead over the holidays if you are good at canning, freezing, or have a dehydrator to make apple chips or apple rings. See the recipes below for a ton of ideas! There are endless ways to use this hearty nearly year-round fruit. We’re particularly fond of simple recipes that require the least amount of work as possible, which is why we’ve created what we think is the best apple crisp at the bottom of this tutorial that’s really super simple. If you use our techniques for choosing the right apples, peeling and slicing them, all of these recipes should not only be delicious but also a healthful way to enjoy this autumnal fruit! Want even more recipes? These posts from others are worth checking out! 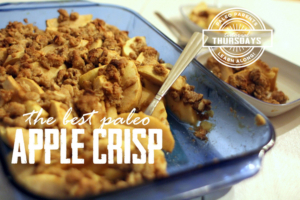 The Best Paleo Apple Crisp! This recipe is inspired by a recent trip to two farms (first and second from Instagram), which yielded a LOT of apples. After making a LOT of homemade applesauce (see I even posted an IG video), I wanted to make our apple pie cupcakes for a friend’s birthday (who had requested something fruity). Alas, attempting to modify the recipe made for something inedible and I was in a last minute scramble to pull something together for the birthday girl (who was already on her way over at that point). Looking at the tray of prepped apples that were destined to be even more applesauce, knowing how buttery, gooey, and caramelized they naturally become when they bake, I decided to simply add a topping to make a crisp. There were only a couple of us celebrating that evening, but the entire dish was gone before the party was over – and they weren’t even paleo people! Lay apple slices in layers in the bottom of a greased 11" by 7" baking dish. In a small mixing bowl, mix remaining ingredients with hands until well combined. Crumble mixture over top of the apple slices. Bake for 35 minutes at 350 degrees, then increase to 400 degrees for 5 minutes. Want more from the Paleo Parents? You can grab their 3 Phase Paleo & Paleo To Go Guide to help make your journey raising a Paleo family a little bit easier! You can also grab a copy of their hit book, Eat Like A Dinsosaur. Please read our Affiliate Disclosure here. Stacy is the matriarch of the Paleo Parents family. After beginning a paleo diet and founding PaleoParents.com in 2010, she lost 135 pounds and found health and happiness for the whole family. The following six years have been a progressive journey with a mission to educate people about nourishing their bodies by eating real foods. 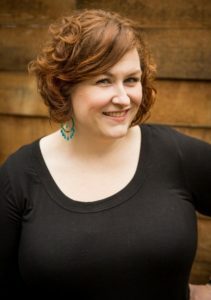 Stacy can be found on all forms of social media as @PaleoParents as well as the top-rated The Paleo View Podcast and her two cookbooks, Eat Like a Dinosaur and Beyond Bacon. 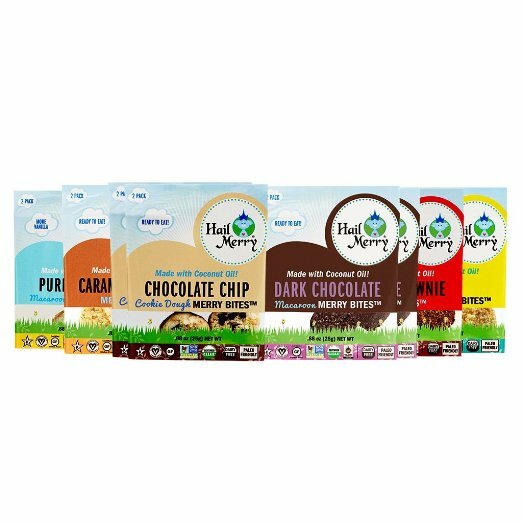 Despite the fact that most conventional chocolate is filled with GMOs, tons of sugar, artificial ingredients, flavors, fillers, and binders, Paleo chocolate on the other hand, is actually quite healthful. It is well known that dark chocolate provides significant health benefits, when consumed in moderation. Paleo chocolate in particular, is one of the healthiest forms of chocolate you will find on the market; and September 13th gives further reason to indulge in more than a bite of chocolate, as the day is known as International Chocolate Day . While there are many brands out there now producing Paleo chocolate bars, sometimes the best chocolates are the ones you make at home. For this reason, we’ve found five delectable Paleo chocolate recipes you don’t have to feel guilty about, from bloggers who know their chocolate. We know what you are thinking … this is a post about Paleo chocolate recipes for International Chocolate Day, and the first recipe we put here is Chocolate Chip ZUCCHINI Bread?! Before you get all crazy on us, don’t knock it til you try it, ok? This isn’t just any Paleo Chocolate Chip Zucchini Bread – not only is it incredibly nutrient dense, but it actually tastes really, really good, and the best part is, you can have it as your Breakfast! 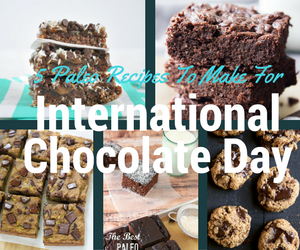 What a perfect introduction to celebrating International Chocolate Day! 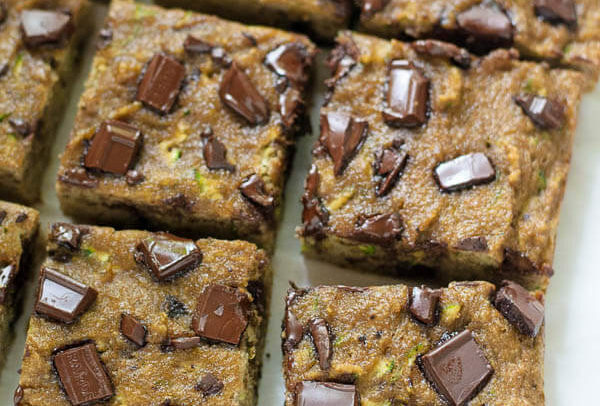 Start your day off with a healthy, nutrient dense Chocolate Chip Zucchini Bread, and work your way up to the much sweeter, more guilty-pleasure indulgences later in the day. This way, you can’t spend the whole day feeling terrible you just chowed down on an entire pint of SoDelicious Chocolate Ice Cream (don’t judge, we’ve all been there). While Erin from Well Plated isn’t necessarily a “Paleo blogger,” she definitely understands the fundamentals of delicious, real foods, and definitely gives the Paleo world a nod with this recipe by making use of coconut flour, bananas, eggs, coconut oil, zucchini, and of course, chocolate chips. To make a warm batch of this bread for breakfast (or a midday snack), head over to Well Plated. This post simply wouldn’t be complete without a simple, Paleo friendly chocolate cake. Lauren Fuentes understands that sometimes the simplest chocolate cake is the best, and she somehow manages to pull off the easiest grain free chocolate cake recipe while still adhering to Paleo principals and not sacrificing on taste either. Sometimes one of the most annoying things about baking cakes is frosting them. We all love the frosting, yes, but taking the time to make it from scratch, and then actually frost the whole damn thing can be time consuming and cause impatient licking of bowls and spoons – because being surrounded by chocolate can make one behave like a child when it involves chocolate. Therefore you are free to enjoy this cake rather quickly after it’s made since you can skip the frosting step with this recipe – it is that good. Furthermore, Lauren gives a bunch of great tips about her recipe in the post, so you don’t have to worry if you have any substitute questions or any other recipe questions for that matter! She has you covered. 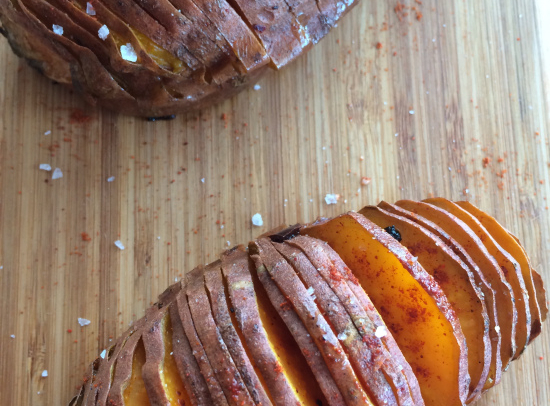 Head on over to Lauren Fuentes’ blog to snag this recipe. The name certainly seems to do this recipe justice; I mean, are you looking at what we’re looking at? A piece of magic, right?? If you’ve never heard of a Paleo magic bar before, it is basally a faux-graham cracker crust topped with gooey caramel, shredded coconut, and chocolate chips. Drool.wor.thy. Melissa from My Whole Food Life is a Vegan blogger, but that hasn’t stopped her from creating Paleo-friendly creations as well, and we’re oh so grateful for that – as these Paleo Vegan Magic Bars look oh so like they are heaven sent! 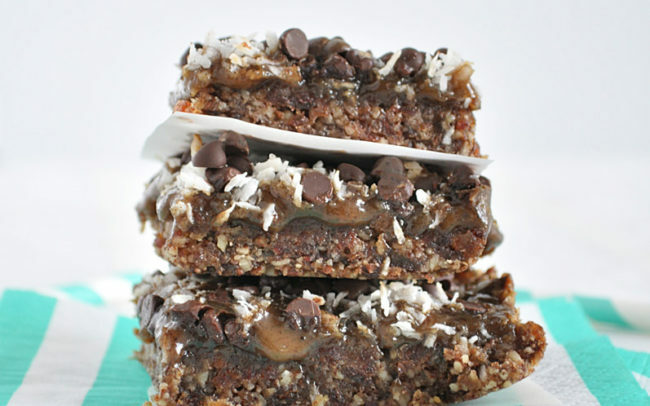 These bars have a few ingredients and are definitely a little higher in sugar, but it is all “good” sugar as it mostly comes from the dates and coconut sugar, and is offset by the healthy fats from the coconut oil, coconut milk, and shredded coconut. 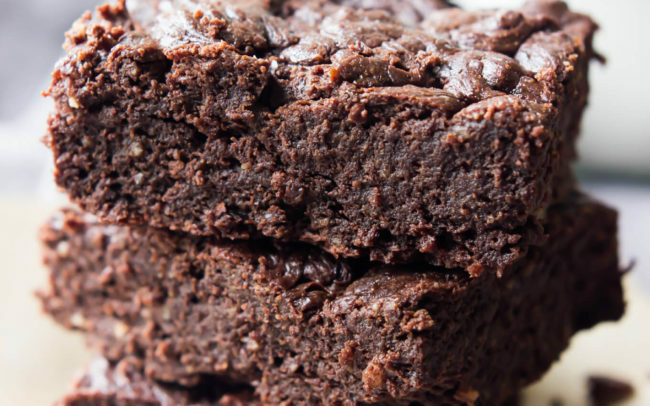 We would be remiss if we left out a Paleo brownie recipe in this post. The thing is, there are SO many Paleo brownie recipes out there now, that it can very difficult choosing which one to include. This recipe by Lauren from Wicked Spatula made the cut because not only is it completely Paleo friendly using ingredients like coconut oil, almond flour, and tapioca starch, but it legitimately looks so decadent, cake-like, AND fudgey that is is almost as if you can taste the brownies just from staring at the picture. And that’s exactly what we did. We virtually taste-tested. Yup – it’s a winner! 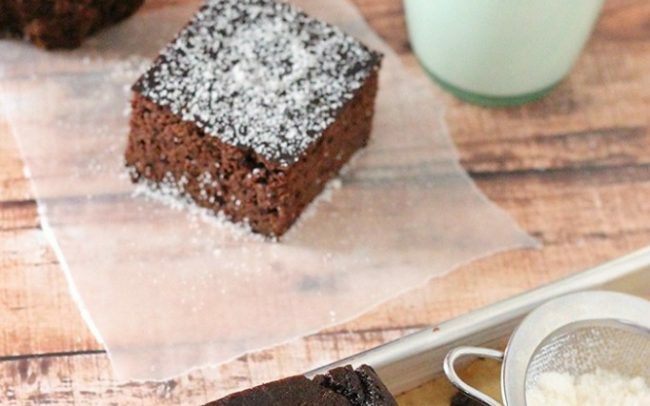 Do us a favor, if you make these brownies because you found them on this post can you please, please, PLEASE send us some?? We’d really appreciate it! 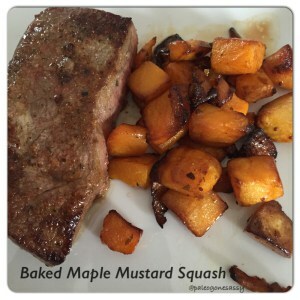 Head over to Wicked Spatula now to grab this recipe! Ah, Easter. The beloved holiday by all children who eagerly look forward to waking up to a basketful of brightly colored “grass,” chocolate bunnies, and pastel colored eggs filled with yet more chocolate and candy. For the average person, Easter is a no-big, a no-brainer. You go to your local Wal-Mart, CVS, Walgreens, or wherever, and pick up a bunch of chocolate and candy, baskets, and fake grass, assemble it at home, and put it out when the children are sleeping. In the Paleo-world, holidays such as Easter can prove a bit trickier. 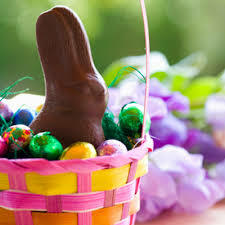 Finding chocolate bunnies and pre-wrapped candy that is devoid of GMOs, white sugar, artificial colors, flavors, and a whole other host of ingredients that can’t be pronounced or associated with nature, can prove to be just as easy as spotting the REAL Easter Bunny himself putting out baskets of candy in your home. 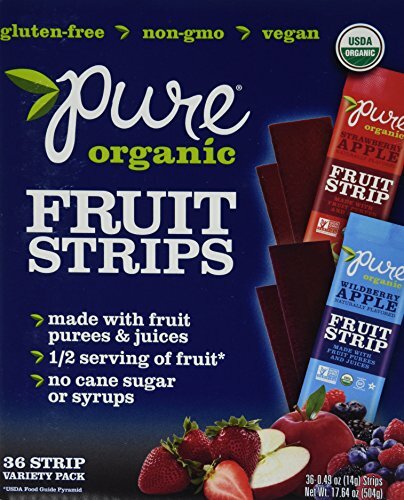 I am aware that there are a few brands now that offer “Organic” candy like lollipops, jelly beans, and gummy worms, etc. 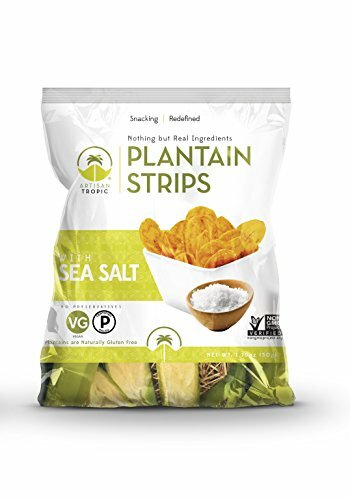 But even these do NOT fall into the Paleo category, as they are still extremely high in white sugar, contain “natural flavors,” as well as other unhealthy oils like sunflower/safflower oil. If you are not die-hard Primal, you may be willing to turn the other cheek and make a once-a-year allowance of indulgence in these “safer” candies. And there’s no judgements there; sometimes convenience outweighs other priorities, I get that. But if you just aren’t willing to give in to the organic, rainbow processed candies, there’s no harm there either. 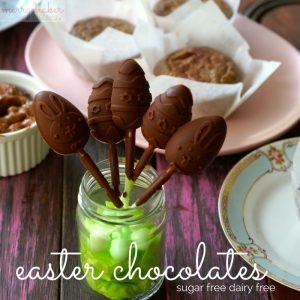 For those of you that want to go a bit more homemade, (and be SURE of what exactly is going into your children’s bodies,) here’s a mashup of a few Paleo-friendly Easter treats I found from some awesome Primal bloggers! Some you can choose to stuff in your child’s Easter basket, and others you can opt to save for desert if you wish as well! Make sure to scroll all the way to the bottom, as I have also included other ideas for Easter basket goodies as well! 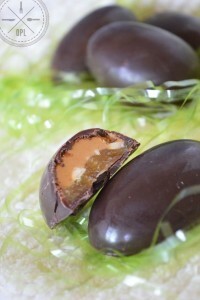 Primal Caramel Filled Chocolate Easter Eggs. I’m sure that when you think back to your childhood Easter days, you would be remiss to forget the Cadbury Eggs. While they were never my personal favorite, they resonate in nearly everyone’s mind with celebrating the holiday. 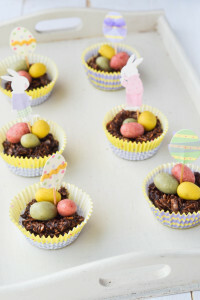 These caramel-filled Easter eggs are not only Paleo friendly, they are kid-friendly as well! Head on over to Our Paleo Life to snag this delicious recipe just in time for Easter. 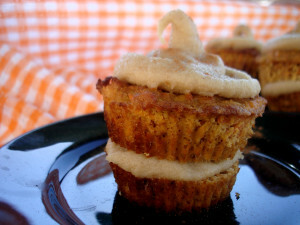 Double.Decker.Carrot.Cupcakes. I can remember as a child my grandmother always bringing those carrot cakes with the cream cheese frosting topped with fake little carrots. Carrot cake was not my favorite; but I did adore the frosting. For some reason, the idea of a Paleo carrot cake or cupcake seems much more appealing to me now than it ever did as a child. I have never made carrot cupcakes before, but this recipe might just make try it, and you should too! 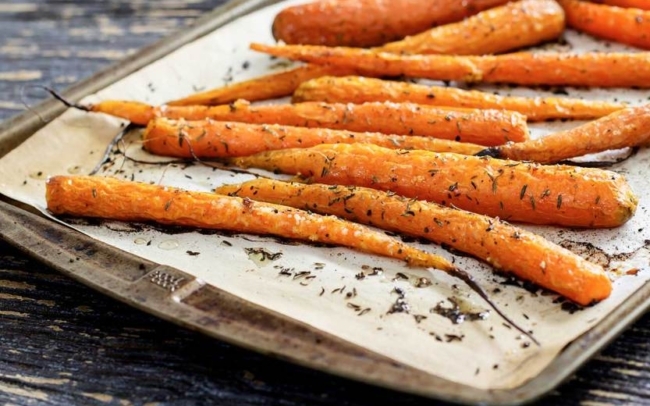 This recipe is actually full of a healthy dose of real veggies, so you can feel good giving it to your family knowing there are no fake sugared carrots here. 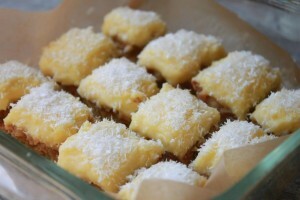 Lemon bars are synonymous with spring. They are light, fluffy, and full of oohey-gooey yumminess. (At least, that’s what my #PrimalKidz tell me!) Traditional lemon bars consist of artificial lemon flavors, lots of white sugar, flour, and other goodness-knows-whatness. You can be rest assured that these Paleo Lemon Bars by Delightful Mama contain none of that ickiness. Instead, they are full of nutritious ingredients like almonds, eggs, honey, and real lemon – a perfect treat that satiates, satisfies, and best of all, nourishes! Wait, I know what you are thinking, another carrot cake recipe? Now before you go hopping off all irritated, just remember something: this is EASTER we’re talking about here! It’s all about the kids..and the bunnies. And bunnies like carrots. 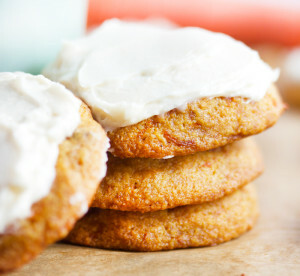 And if you aren’t a fan of carrots and cupcakes, I can promise you, you will be a fan of carrots and cookies – especially when it’s paired with a decadent vanilla maple frosting! You don’t have to worry about a sugar crash either..because these cookies are the most nutrient dense cookies you will ever sink your teeth into on Easter. Who says Easter has to be hard? This recipe for raw chocolate easter egg nests is as easy as it gets. While the ingredients may go by UK measurements, she does note at the bottom of the recipe not to get too hung up on the preciseness of the ingredients; a handful of each of the nuts/seeds will be enough to create these wonderful and yummy looking treats that will be sure to have your little one hopping for joy! 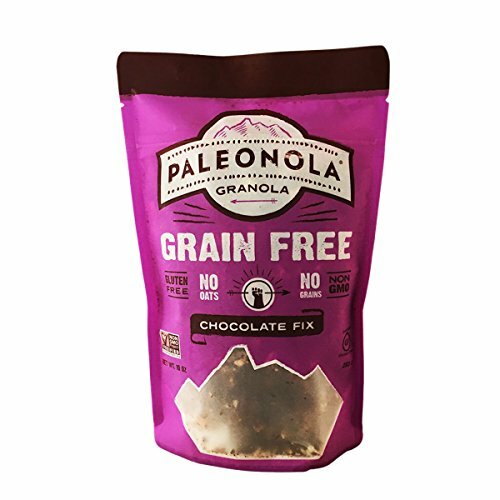 There are a few packaged Paleo goodies that your kids would love to find in their baskets! 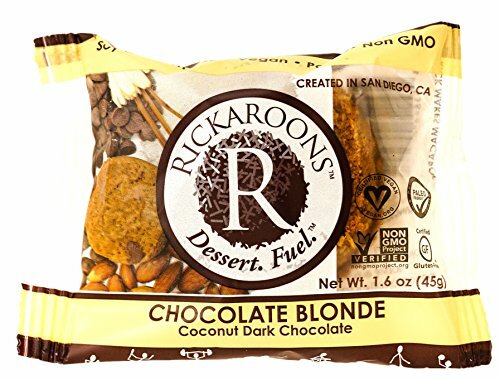 Some of my favorites include: chocolate chip cookies by WB Kitchen, Almond and Sea Salt Chocolate Bar by Eating Evolved, or these Wonderfully Raw, Organic Vanilla Maple Coco-Roons. Many times parents (and kids) tend to focus on the sweet-tooth side of Easter, but there are so many other things you can use besides candy and chocolate! Venture out to your local Wal-Mart and peruse the Easter section you just can’t miss walking in. This area is generally loaded with $1-3 goodies that any child would adore. Examples of fun basket stuffers include: pens, pencils with cute erasers, note pads, coloring books, bubbles, colorful bracelets and rings, mini-pinball games, glowsticks, balloons, and much more! A giant stuffed Easter bunny! (Or a mini one too). A new soft blanket if you have little ones. Make a fun Easter egg hunt by placing a few plastic eggs filled with coins in your child’s basket, then strategically hide them around the rest of the house, outside on your lawn, in your car, or wherever! Fill all of them up with pennies, nickels, dimes, and quarters, and then fill just ONE egg with a $1, 5, or heck even $10 or $20 bill. This is something my extended family does every year, and it is always a blast watching them squeal with excitement when they find the “golden” egg filled with real cash! There you have it! You have no excuse to not be prepared for a healthy and delicious Easter now – so go ahead and start planning your your happy, healthy, Easter holiday! Please be aware that this post does contain several affiliate links, which bear no extra cost to you, but should you choose to purchase any items through these links, they do help support my blogging endeavors!